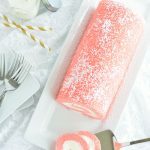 Impress your family and friends with this yummy creamy filled Pink Velvet Swiss Roll that is a lot easier to make than you might think. 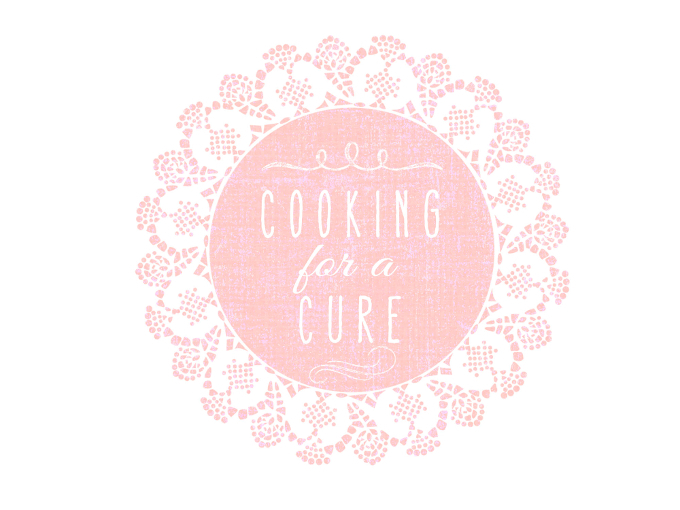 In honor of National Breast Cancer Awareness month I joined some fellow bloggers in “Cooking for a Cure” to create something PINK to help raise breast cancer awareness. If you’re not aware, besides skin cancer, breast cancer is the most common cancer found in women. Statistics show that 1 in 8 women (in the U.S.) will at some time in their life develop breast cancer. The good news is that the death rate is on the decrease thanks to early detection and advancementsin treatments. In fact, my mother-in-law is a recent survivor of breast cancer. She was diagnosed early last year which gave us all a good scare. The doctors fortunately found that the cancer was still contained so she underwent surgery to remove the mass and had radiation treatment everyday for a month. It was painful and exhausting both physically and mentally for her especially since she continued to operate her in-home child daycare. I remember talking to her during it all and saying how soar she was from surgery and that the radiation burned her skin. I’m so grateful for modern medicine and that she is cancer free and healthy again. She is truly one of the strongest, most kind, and optimistic woman I know and couldn’t imagine losing her so soon. I’m so glad I have her in my life and get to call her “mom”. 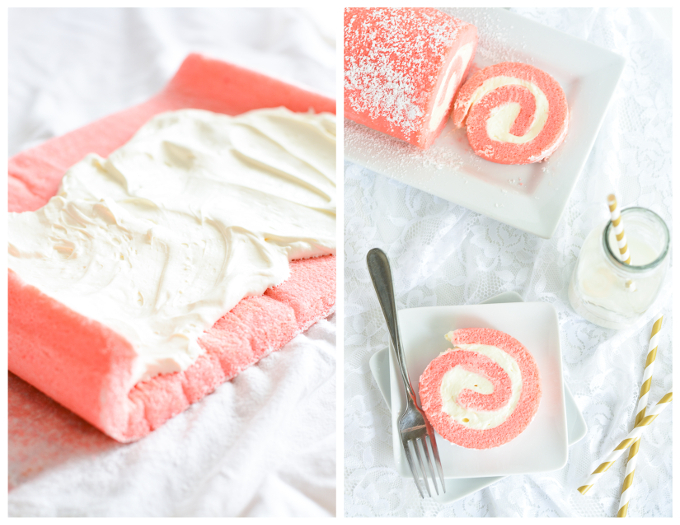 Today I’m sharing my recipe for this lovely Pink Velvet Swiss Roll. 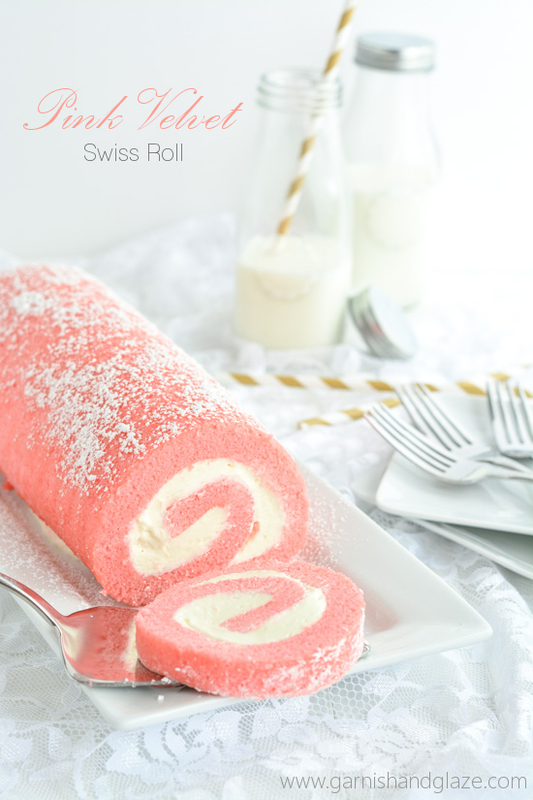 It was actually my first time making a Swiss cake roll and found it to be much easier than I imagined… so there might be a few more of these cakes in my future. 😉 It only takes 15 minutes to cook and about 20 minutes prep time. The cake is super soft and stays moist for days. It has the perfect amount of filling which is light and perfectly sweetened. It’s a mixture of cream cheese, cool whip, and a little powdered sugar. So yummy and refreshing! Go make this yummy cake and then get out in your community and help raise breast cancer awareness! … And make sure you are getting regular doctor check ups and and doing self exams. Early detection is key! Lay a tea towel on a flat work surface and sprinkle it with powdered sugar and set aside. In a large mixing bowl, beat eggs on high for 3 minutes until pale in color. Continue beating as you slowly add in the sugar. Add the oil, buttermilk, vinegar, vanilla, and food coloring and beat for 1 more minute. Add in the dry ingredients and mix until combined. Pour batter into pan and tilt to even out the batter. Unroll the cake and spread the filling evenly over the top. Roll the cake back up and place seam side down on a platter. Cover with plastic wrap and place in the fridge for at least and hour before serving. Dust with powdered sugar, slice, and serve. Just love this beautiful and elegant cake! And so glad to hear that your mother in law is doing well now. Great post! Melanie, your mother in law sounds like a total champ! What a terrible trial to experience and I am so glad to hear she is doing well. This cake is absolutely gorgeous. 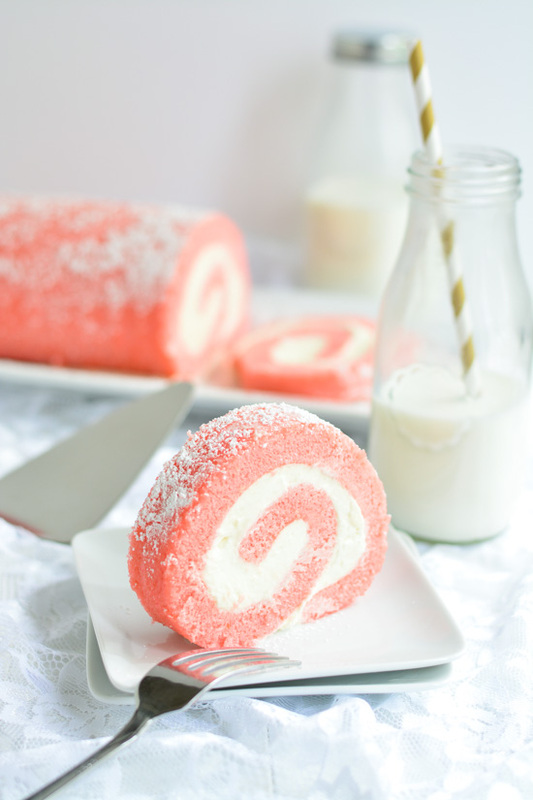 I have never made a roll cake but I really want to try! She is! Thank you Amy. 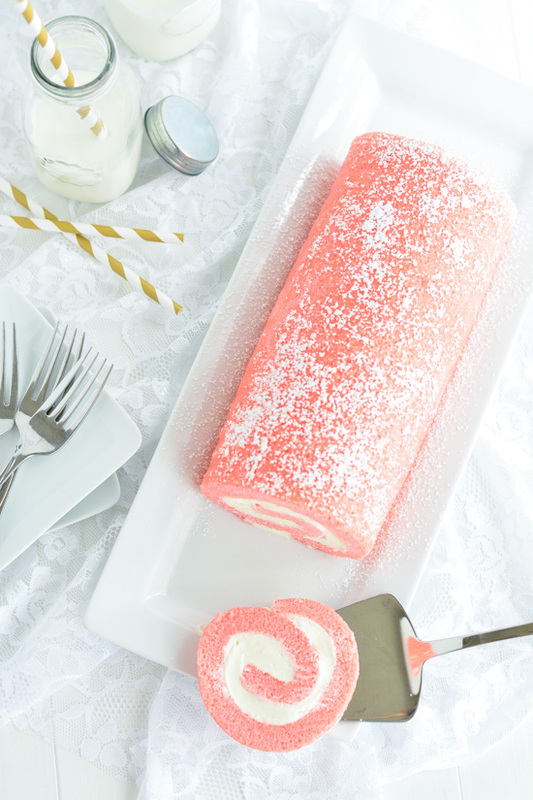 Yes, you’ll have to try this cake roll. It was so much easier than I thought it would be. I thought the cake would be flimsy and really delicate but it was really easy to work with. 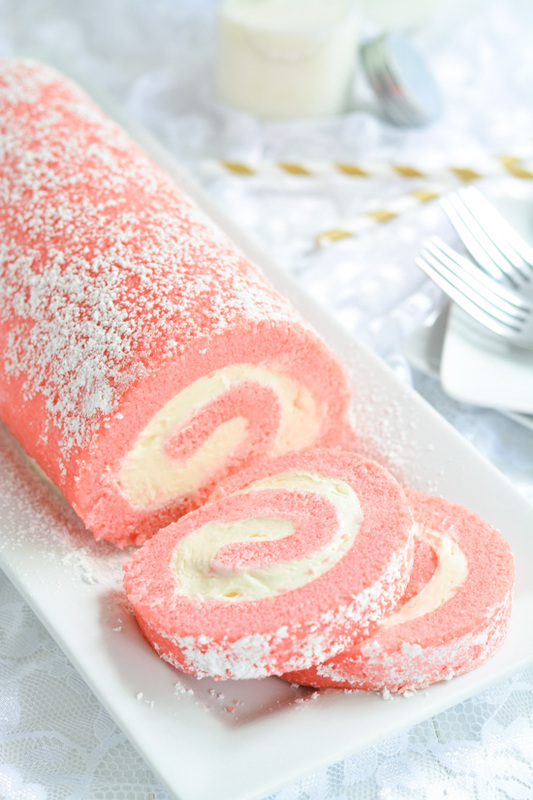 I keep thinking up tons of different flavor combos for cake rolls now. I really want to try one with ice cream as filling. This is absolutely wonderful. I love the pink. Thank you Meg! Hope you get a chance to make this soon. I love this post!! Such a great cause! and glad to hear your mother-in-law is ok. . love love love the pink velvet swiss roll cake!!! so beautiful!! This is a beautiful dessert for a beautiful cause. Thank you for sharing. so pretty and looks tasty! People in my family are always terrified to make this cake…but it looks so beautiful. So beautiful. And I think baking is a great way to bring people together and raise awareness! Thanks for stopping by Foodie Fridays! Tell them not to fear Christine! I thought the same thing and was surprised by how much easier it was than I imagined. This is one of the most beautiful cakes I’ve ever seen. Seriously. What a great cause and so good to know that your mother-in-law is healthy! Thank goodness for modern medicine! This is just beautiful!! And it looks delicious too! I have several friends who are breast cancer survivors…I’m so glad to hear your mom in law is healthy now. We lost my father in law to cancer over the summer and we miss him terribly. I’ll be pinning and sharing your recipe. Thank you Michelle! It’s so sad to see a loved one suffer through the pain of cancer. I’m so sorry for your loss. Haha! Any time! 🙂 I really appreciate you including it in your roundup! Oh my worrrrd! I don’t think I’ve ever seen a more beautiful swiss roll. Everything about it is 100% perfect! Hi! It’s so pretty! I’m trying to make it now but I noticed that Step 3 says to add powdered sugar when there’s no amount written for it. Is it supposed to be the baking power?? Yes! Thank you for bringing that to my attention. Just fixed it to say baking powder not powdered sugar. I hope it turned out for you Dora! Such a beautiful cake! Love the color! Do you know if there is any adjustments to the recipe for high altitude? Does it have to be cool whip or can you make your own whipped cream from scratch and add to filling? Jacob, You can make your own whipped cream. The cool whip is stabilized with gelatin so it will last longer in the cake but if you plan to eat the cake using made-from-scratch unstabilized whipped cream you’ll want to eat it within about a day. How many days will it last? Hi from Australia, any alternative to cool whip? Super keen to make this delicious looking cake! Hi Carissa! You could instead make your own stabilized whipped cream.